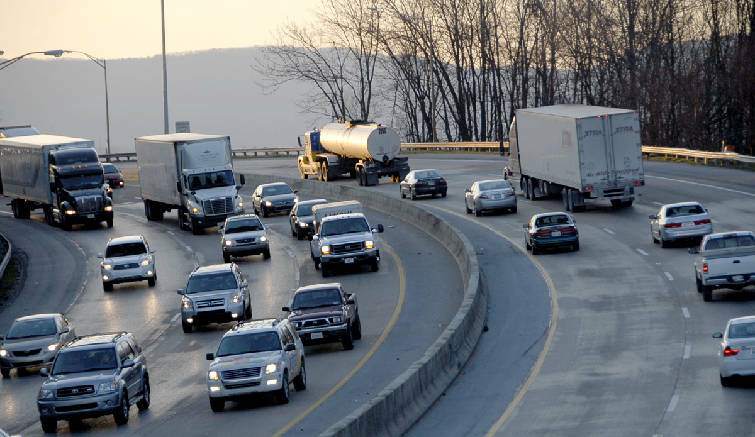 Staff File Photo by Matt Fields-Johnson/Chattanooga Times Free Press Traffic makes it's way on Interstate 24 over Missionary Ridge. Amid one of Chattanooga's worst recessions, a pioneering community planning process in the early 1980s helped galvanize Chattanoogans to build a better place. Vision 2000 gathered hundreds of Chattanoogans from all walks of life to spur the eventual building of everything from the world's largest freshwater aquarium to a series of downtown parks and riverwalks. Coming out of an even longer economic downturn over the past two years, Chattanoogans appear to have shifted their community ideals. In an updated and larger version of the visioning process released Monday, the group known as Stand said thousands of residents who answered questionnaires last year said the city's biggest challenges now involve its people, not the place where they live. * Stand representatives will present localized results to neighborhood groups and nonprofit agencies. Summits are planned later this year on the topics of public education, combating crime and improving the environment. "Twenty-five years ago, a group of Chattanooga visionaries began a process that transformed the place we live in," said Stephen Culp, president of SmartFurniture and an organizer of the Stand campaign. "Twenty five years later, Stand has become more about the people that live in that place." The results of what its organizers call the world's largest community visioning survey suggest that Chattanoogans rate education, crime and jobs, in that order, as the biggest challenges. Among the 26,263 surveys filled out in 2009, Chattanoogans said they most like the natural beauty, the sense of community and the vitality of downtown. Hamilton County Mayor Claude Ramsey, who helped encourage some of the Stand organizers to launch their community surveys a year ago, said he was not surprised to see education at the top of the community's concerns even as area unemployment has risen to a 27-year high of 10 percent. "Educating our young people and preparing them for the jobs of the future has to be the priority of our community," he said. "I think it starts in the home, but we also have to have good teachers, good schools and community support for learning." Alison Burke, a fellow with CreateHere who helped analyze the Stand surveys, said the investments sparked by Vision 2000 in the 1980s made Chattanooga a better place to live. "Thirty years ago, we wanted to love this place, and we connected the quality of life with natural and man-made environments," she said. "Stand responses show that now we're ready to focus on the people populating our region -- how they live, work and play in this place we call home." Stand organizers and community leaders concede the 21st century challenges may be even harder than the dramatic turnaround made in Chattanooga at the end of the 20th century. "But Chattanooga has demonstrated that it can do great things when people come together and are motivated by a big ideal," said Josh McManus, a senior fellow for CreateHere and another leader in the Stand campaign. "We have a history of making things happen." As it did a generation ago when Chattanooga cleaned up its air and revitalized its downtown, the city again could be an example of how to tackle tough challenges, Stand backers said. "It's going to take a lot of intensive conversation for our community to figure out we can address some of these challenges identified from these surveys," said Helen Johnson, co-founder of CreateHere and one of those involved in the year-long Stand campaign. "Chattanooga could be a model for how we address these issues." City Mayor Ron Littlefield, who served as one of the executive directors of Venture during the 1980s, said the new data from the Stand surveys continues in that tradition and "will be an invaluable tool" for future decisions. "This is an extraordinary effort and an asset to Chattanooga," Mr. Littlefield said of the results. Unlike the previous investments in major projects, the new initiatives also may require a broader base of community support compared with the wealth of foundations such as Lyndhurst, Benwood and Tonya that bankrolled the upgrades in the 1980s and 1990s. "As we have said repeatedly, the next big thing for Chattanooga is a million little things," Mr. McManus said. Stand is planning summits on education, crime and the environment later this year. Also, Stand representatives plan to show localized versions of the data to neighborhood and community groups. "We have over 300,000 responses from our surveys to help us identify values and needs to make our community better," said Katherine Nielsen, Stand campaign coordinator. "We want people to be able to draw from this regional data as well as very specific information from their neighbors to help guide where we go in the future." Wade Hinton, corporate counsel for Volkswagen of America and another Stand organizer, said the gathering of public opinion over the past year has helped encourage more people to get involved in community issues. "Stand will call people to action with these summits, but I also think you'll see a lot of nonprofit groups and individuals use this data to help bring people together and to think up new solutions," he said.